I didn't think I could love this series any more than I already do! Last year, Ink and Bone captivated me, and the ending left me up in arms and ready to storm... something, for the sequel. 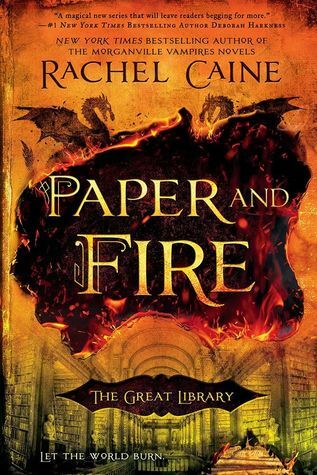 Paper and Fire is nothing I was expecting, and so utterly satisfying. I got everything I was waiting for, and then some! Now I'm hankering for book three! Jess Brightwell is in training to be a soldier of the High Garda, with Glain as his squad leader. After Thomas's death, and Morgan being sent to the Iron Tower, Glain is the only one Jess trusts. Jess pieces together something incredibly unbelievable, and he rallies the group (Glain, Khalila, Dario, Wolfe, Santi) to try and do the impossible. Nothing is easy; Khalila is a Scholar, as is Dario. Santi is a commanding officer. Wolfe seems unstable. And everyone, including the Archivist, has their eyes on Jess. Nowhere is safe, and no one is trustworthy. I was pleasantly surprised by how quickly I fell back into the story! I remembered the ending of Ink and Bone very well, but most of the details from the book escaped me. Caine makes it very easy to slip back into Jess's head (third person perspective), and I didn't feel lost. In fact, you could probably get away with reading this book without having read Ink and Bone at all - though I don't recommend going that route. Ink and Bone was intricate and complex and SO good! I swear Jess is Spiderman or something! He isn't a natural soldier (he was training to be a Scholar! ), but he gets into shape and follows his duties and his training and excels (in my opinion). He's also retained his intelligence and cleverness, and all of his mastermind criminal ways (from his family business, if you recall). But more than all of these things, Jess has a big heart and a selfless soul. He was never a violent person, but he has matured so much between books, and will do what he has to, to protect his friends. He isn't irrational (he's pretty clever! ), but he constantly finds ways to throw himself in danger's way, rather than another person. We get to see a lot more of Wolfe, and Santi (and Wolfe and Santi), and Glain. I can't remember how I felt about Glain in book one (I remember she was rather cold? ), but I really liked her in this book. She comes across as ruthless, a punishing leader, but she is efficient and tough and capable. The beginning doesn't start with a bang, but the action really picks up quickly and never slows down. This pacing worked for me! It didn't feel too fast, but I couldn't read fast enough, and my heart was constantly pounding. Caine had me guessing about so many things - was ____ trustworthy? Would Jess survive this automaton attack? Would Wolfe be lost to his memories? So many worries! I loved the high-stakes, high-action plot. I loved Jess and his character growth - he is fearless, and takes challenges and faces them head-on. I love seeing so many secondary characters, and how dynamic and important they were. I was pretty excited to see the reappearance of two key characters. I feel like this book has several parts to it, and to describe each part would be spoilery. But I liked how Caine kept weaving the story in a different direction than I expected. And how she took us to many different locations (and the associated dangers!). I'll say a little on the romance. There are multiple ships! We know that Wolfe and Santi are a very solid thing. Jess and Morgan are totally in love with each other; but as Morgan is in the Iron Tower (and Jess is wracked with guilt), their relationship does take a hit for some of the books. But I like how things smoothed out - there was conflict upon reunion, but the pair came to an understanding. I hope they won't be separated again! No love triangle(s), or anything of the sort. Also, no cliffhanger (not really). Overall, I'm very pleased with this sequel novel. It is quite possibly one of the most exciting sequels I've read for the year, and one of the best too. I don't know how I'll manage the wait until book three is available! I can't think of anything specifically? I'm sure there were things while I was reading the book, that bothered me a little. And I know I'm giving this four stars (as opposed to five stars). But this one is a 4.5-star-read to me, and my picky self is going to round down. STILL, I loved this book! 4.5 stars -> rounded down to 4 stars. Again, I'm being picky. There aren't factors against the book that are pushing me to round down. I love this sequel and cannot wait to read the conclusion! Here is hoping Caine doesn't break out hearts. Thanks to the wonderful people at Berkley/NAL, I've got a trade paperback copy of Ink and Bone up for grabs! USA only, ends 06/06. Good luck! I haven't read this new Rachel Caine series, but loved her Morganville Vampires and Weather Warden series! Oo high action! I need to try this series so bad. Wonderful review! I'm glad you enjoyed it and it didn't suffer from second book slump! I have yet to read Ink And Bone, though I really want to because of your review and the fact that it is called The Great Library series. Library! Great review and thanks for the chance! I have been looking for a series with some action lately. I haven't read this one yet but anything with a library has to be good. I've heard really good things about this series and I even bought the first one but I'm waiting to have all the books first to read it. I like the sound of Jesse a lot. And multiple ships. And action! This is right up my alley! I'm glad this second book was as great, Alyssa! I haven't read Ink and Bone yet, but I really want to because it sounds really interesting, is about a library, and I've loved Rachel Caine's other books. I have not read ink and bone but I've been wanting to bc I'm a huge fan of Reachel Caine! I haven't read Ink and Bone yet, but it is a series I've wanted to read since that one first came out. The fact that it has to do with a library is what has won me, because I am a librarian, so anything to do with that is something I will love! Thanks so much for the giveaway! Plus I'm going to get to meet the author in September and would love to have this to get signed! I have not read these books yet, but I can't wait to because I love books that are about books! I have not read these books yet but I love the author and her other series. I have not read Ink and Bone yet, but I am going to add it to my TBR list. I really enjoy when you can jump back into a squeal I feel like that shows how great the writing is. Also, I enjoy seeing character growth throughout a novel. This idea of knowledge corrupting people is intriguing. It makes you think, can it actually happen in real life? How does it work? It would be interesting to read about a world where they have to deal with it. I borrowed Ink and Bone from the library earlier this year, but it expired before I could get to it. Now, It's never available. Great review! I could never imagine a life without owning books. The Great Library sounds like a series I need to read. I'm another one that hasn't these books yet. I've been wanting to since I first heard of Ink and Bone! I really need to bump it to the top of my towering tbr pile! The thing that hooked me was LIBRARY! I'm all about stories that have libraries! I haven't read Ink and Bone but I'm so excited to read it becuase LIBRARY! LIBRARY! I havent read Ink and Bone but i sure will now! I haven't read Ink and Bone, but I hope I read it someday. Glad you enjoyed this sequel! Eee :D So glad you liked this book so much sweetie. <3 YAY for enjoying book two in a series :) That is the beeest thing. Yess. Not books for me.. but gah. I'm curious :D YAY for good romances. <3 The rest seems awesome too. I have not read Ink and Bone yet, but it is in my TBR pile for the summer! Yes, I have read Ink and Bone. I loved Jess! And I can't wait to find out what happens next! I haven't read Ink and Bone. I would love to read this series because it sounds really imaginative. Thanks for the giveaway! I haven't read Ink and Bone. The setting and the fantastical elements sound right up my alley. I have not read Ink and Bone, but it is on my TBR list!! I haven't read Ink and Bone, but I would love to . I haven't read Ink and Bone yet but I hope to soon! Loved INK AND BONE and can't wait to read the next one. I love library centered stories so I am looking forward to reading this series! I haven't read Ink and Bone. I'd love to! Jess seems like someone I'd like to know. And it's a book about books. Come on, why wouldn't I want to read it? :) Thanks for the opportunity to win! May 2016 New Release Giveaway!